Starless & Bible Black – great album reviews! 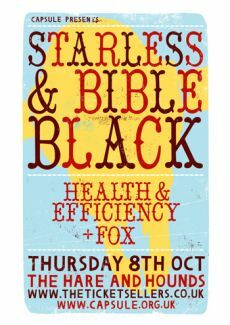 Looking forward to the Starless & Bible Black show at the Hare and Hounds on 8th October 09, especially after reading these brilliant reviews! Anglo-French folk rockers named from Dylan Thomas via a King Crimson LP.Can you have too much of a nice thing? The world is currently awash with pretty female-fronted folk rock, the kind of thing that once had Mike Mansfield presenting a Cue The Music TV special on Judie Tzuke and gravely cooing, “Ah , a voice of the purest crystal.” The second album from this Manchester based group starts a bit like that. But by track three, Hanging On The Vine, they reach more challenging terrain. Singer Helene Gautier channels Sandy Denny over Cortez The Killer-period Neil Young. musical mood like a haunted stroll across the moors. By the time they’ve reached Les Furies, Raz is percolating away in full-on Floyd mode, the bass is burbling fruitily and it’s clear the more mind-blown fringes suit them well. Shape of the Shape is the second album from Mancunian collective Starless and Bible Black and this time they’ve kicked the banjos into touch, opting instead for the sound of the 70’s. The musicianship on this album is exquisite, and showcased perfectly by a warm, organic recording which derives from twilight sessions in the magical wilderness of Snowdonia. The music may have become more eclectic but everything on the album still rotates around the soulful vocal talent of Hélène Gautier who shimmers and smoulders throughout. The end result of this melding of talents is an album which is essentially timeless and which demands attention; this is a record to be savoured on those dark winter’s evenings ahead. Heavyweight in quality but fluid and expansive in execution, Shape Of The Shape is epically beautiful. Exquisite guitar-based arrangements are layered and unfolded with a natural, organic grace made almost spiritual with dreamy, synth elevations. Moody yet warm, these compositions are the type that need little help from production gloss, reverberating with a sheer, natural pulse that really can’t be faked. They somehow manage to be both nostalgic and freshly modern, a clever feat indeed.